Even though androgenetic alopecia, more commonly known as male and female pattern baldness, affects millions of people throughout the world, research into its causes and how to effectively cure this common affliction has remained inconclusive. While a hair loss cure does not yet exist, modern restoration methods have been able to provide more effective treatment than ever before. One of the newest and most promising hair loss treatments, platelet-rich plasma (PRP) therapy, provides visible results for the majority of patients without significant side effects or downtime. At Carolina Hair Center, Dr. Cooley and our expert staff are proud to offer the latest in hair loss solutions, including PRP therapy injections. PRP utilizes the growth factors and nutrients present in the patient’s own blood to provide an instant boost to aging hair follicles. At the start of PRP therapy appointments, a small amount of blood is drawn from the patient and then centrifuged to separate the nutrient-rich plasma from the red blood cells. The concentrated serum is then injected into the scalp using a series of strategic injections to target the areas most in need of increased hair density. The growth factors and nutrients work to reactivate and rejuvenate aging hair follicles. Because PRP is derived from the patient’s own blood, there is no risk of compatibility issues or adverse side effects. Patients can resume normal activities the day of their appointment. PRP therapy is a safe, simple treatment that can be repeated as necessary for sustained results. As a new treatment option, research into PRP’s efficacy is still underway. Studies suggest an estimated 70 percent of patients experience optimal results following PRP therapy. Not every patient may see visible changes in their hair growth right away, but PRP injections are a crucial part of the hair restoration process for patients interested in combatting androgenetic alopecia from every angle. At the onset of treatment, PRP therapy needs to be repeated on about a monthly basis for three to four months before noticeable improvements may be visible. Following the initial series of treatments, PRP therapy only needs to be repeated about every six months. Each patient’s results are different and treatment schedules may vary, but most patients see significant growth in the first three months. While PRP for hair restoration on its own can provide satisfying results, it is just one part of a comprehensive approach to stopping hair loss. The two leading hair loss medications, Rogaine and Propecia, should also be used to slow hair loss as much as possible. When used together, this three-pronged approach can stop hair loss in its tracks and restore youthful, thick hair. 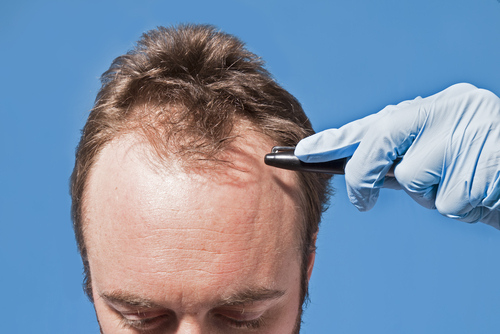 PRP therapy is also an important part of the hair transplant process. PRP therapy may be used ahead of hair transplantation surgery to increase hair density in donor sites for a better procedure, or after the procedure to accelerate recovery and results. If you are interested in PRP therapy to complement your hair transplants, then let Dr. Cooley know ahead of your surgery. If you are interested in staying informed on the latest developments in hair restoration, then come on into Carolina Hair Center today to learn more about PRP therapy. Dr. Cooley prides himself on staying at the forefront of research into advanced hair loss restoration. In addition to PRP treatments, we offer hair transplantation surgery and an individualized approach to hair loss for personalized results. Call us today at 704-542-1601 to schedule a consultation with Dr. Cooley.